Fresh country air. Walking distance to highly rated schools. When both of these are true for a community, you know you’ve found a keeper. Located near I-295 and Route 301 in Hanover, Giles gives you the best of both worlds. Inside these luxurious new single-family homes near Atlee High School, every detail is designed for the way you and your family live. With two collections to choose from, you will enjoy incredible choice and flexibility - learn more below! Then, step into your yard for a little fresh air. In the mood for a swim? 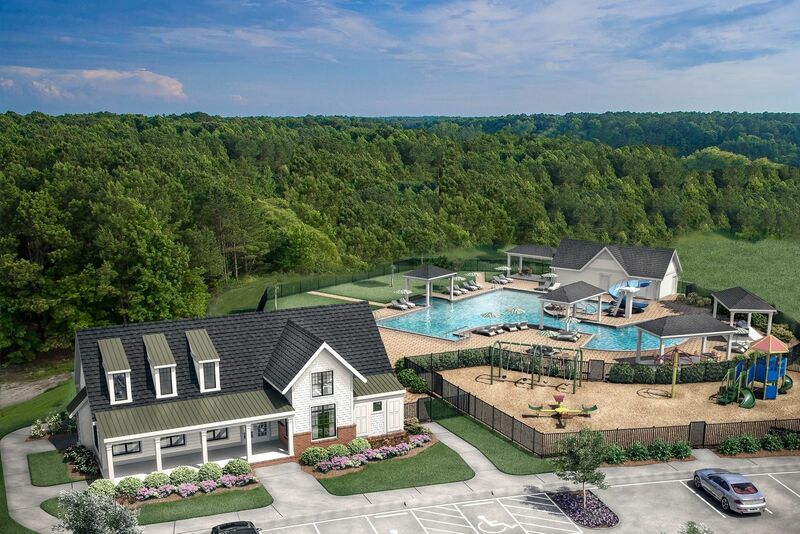 The pool and clubhouse are just a few steps further! Feel more like staying on dry land? Check out miles of walking trails, hours of fun on the zipline, and playground, or fitness course nearby. We’re excited to introduce this new community, and want to share the latest information with you.Join the Priority List and be the first to receive news and updates on Giles, as well as floorplans, homesites, pricing, incentives, and VIP-only invitations. The James Collection Bold, dynamic and iconic, just like the James River: this collection of floorplans will feature new homes from the $340s to the $390s with square footages ranging from approximately 1,400 sq. ft. up to 2,400 sq. ft. Each home will include a 2-car garage, an open concept and of course, a Giles-standard Hardiplank exterior. The Rappahannock Collection When we think of this collection, the Rappahannock River and Hanover itself,we think of three entities that are timeless, stately and classic. The Rappahannock Collection will feature new homes from the $390s to the $420s with square footages ranging from approximately 1,800 sq. ft. up to 4,000 sq. ft. Each home will include a 2-car garage, an open concept and of course, a Giles-standard Hardiplank exterior.